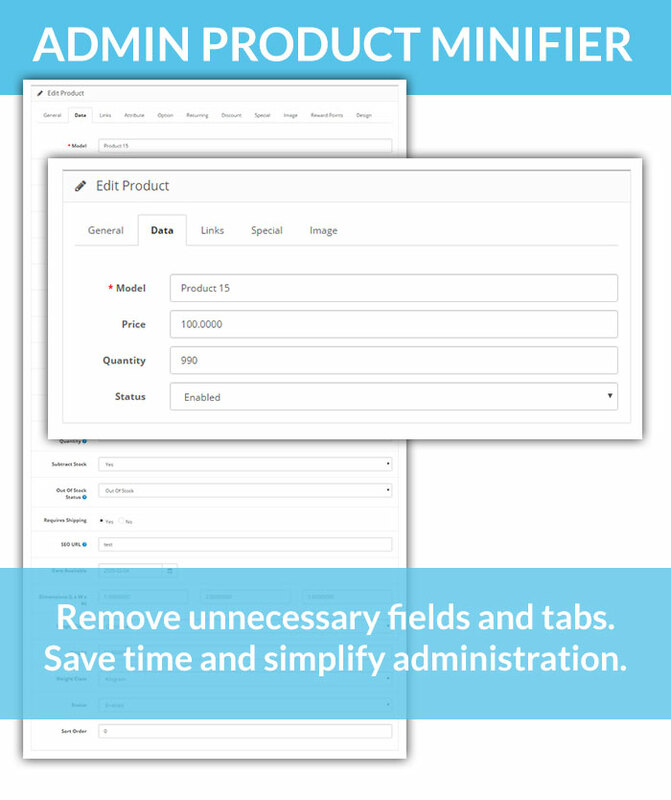 Admin Product Minifier lets you hide unnecessary fields and tabs from Admin > Catalog > Product (add/edit) page. 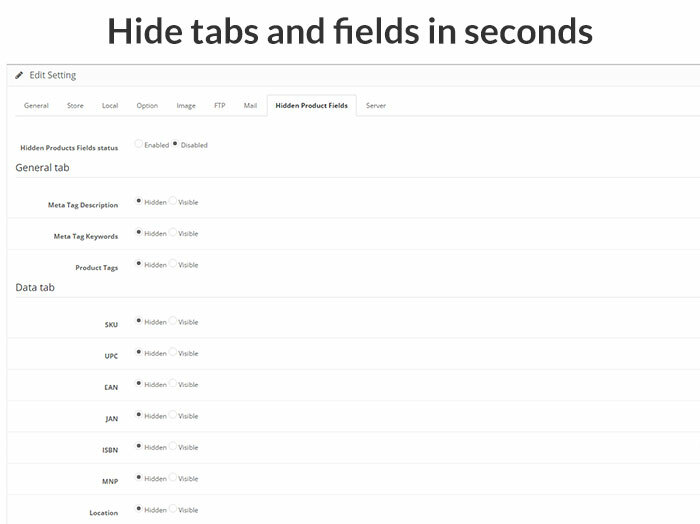 Most of the fields (specified in Features) can be hidden so it's possible to optimize and simplify the workflow and hide the unused fields and tabs from e-shop product editor. These tabs can be hidden: Attribute, Option, Profiles, Discount, Special, Reward points, Design. These fields in General tab can be hidden: Meta Tag Description, Meta Tag Keywords, Product Tags. These fields in Data tab can be hidden: SKU, UPC, JAN, EAN, ISBN, MNP, Location, Price, Quantity, Tax Class, Minimum Quantity, Subtract Stock, Out Of Stock Status, Requires Shipping, SEO Keyword, Date Available, Dimensions, Length Class, Weight, Weight Class, Sort Order. These fields in Links tab can be hidden: Manufacturer, Filters, Stores, Downloads, Related Products. If you hide price field, You can set default price value. If you hide quantity field, You can set default quantity value. 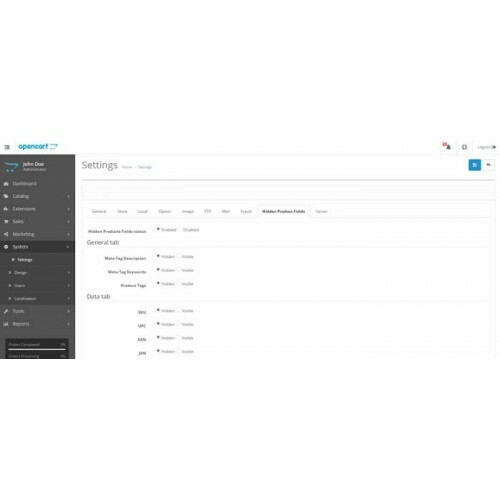 For OpenCart v1.5.4.1 - v2.0.0.0 vQmod is required. Later versions use OCMOD. Extension Settings can be found on System >> Settings >> Default Store >> Hidden Product fields . 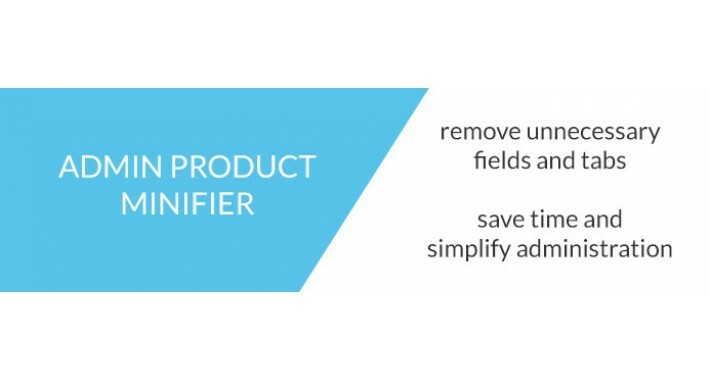 Video how Admin Product Minifier works - https://www.youtube.com/watch?v=7nnZywOWfbc . 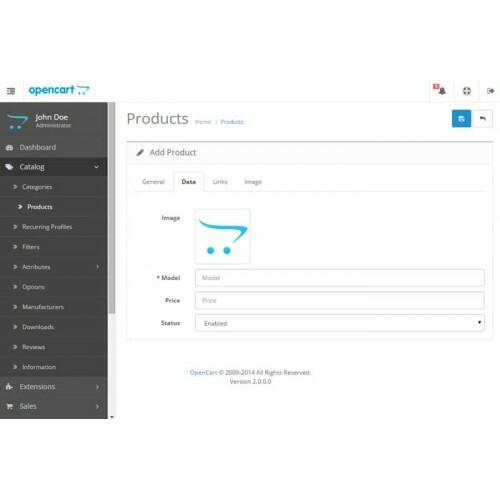 Added support for OpenCart v3.0.3.1 version. THIS EXTENSION IS ALSO AVAILABLE IN OPENCART PRODUCTIVITY PACK with other 7 great productivity extensions built by ImakeITwork.